One of the biggest Russian publishing houses, "AST", is going to publish the book of V.Bologan "Footsteps" (256 p., 52 games and fragments, autobiography, fragments from author's diary, photos and tournament tables). "In our computer epoch few of strong chess players think about writing a book. It is a time-consuming work that does not get enough financial compensation from chess professional's point of view. Moreover, to write a book one must have some ideas that make it interesting to wide chess public. That is why I took Viorel Bologan's manuscript with interest. The size of it impressed me, and knowing Viorel, I had no doubts I would find many interesting chess thoughts in it. I think all chess players that want to continue their perfection should read it. The book certainly addresses young chess players first of all. They are sure that all the necessary information concerning chess can be found in the Internet or contemporary chess databases. As a matter of fact, nothing can substitute for printed words, because for perfection one needs to understand what was done before and also be able to adapt this information to one's chess style". to live the whole life". The hardest thing in sport is to make oneself work, to discipline oneself. It turned out that despite living in strong intellectual environment, psychologically I was left to myself. I obviously lacked Gata Kamsky's father that would have given me no chance to relax. After the Soviet Union championship I felt the ground slipping away from under my feet, although everything looked rather decent. After the bad play it the New Year tournament in Stavanger (Norway) two failures followed, in India and France. And in Calcutta I lost the last round to the local idol, rising chess star Viswanathan Anand. Turning over the pages of the diary of that time, I paid attention to the notes concerning my psychological condition during the Indian tournament. One thing is to write and another one to fulfill. In February the Cappelle la Grande tournament follows, then a short April warming up – sharing the 2nd-5th places together with Kramnik behind Shirov in Oakham (Britain) and absolute failure in the 9th category tournament in Romanian city Calimanesti in May. Here it was not late to stop and reflect. But unfortunately, competition calendar is often merciless to a player. Just after Calimanesti the Chess Olympiad in Manila followed, brining the loss of 25 rating points. I started fine with 3 wins in 4 games, but then I fell ill – hated air conditioners have done their part. We had no substitutes, so I did not have enough health to play 14 rounds. And then till the tournament in Greece I did nothing but rested. Some work was done of course. Turning over the pages of my diary, I found detailed annotations to Manila games, but there were no conclusions, no clear guiding lines. Nevertheless, the relaxation did me good, and I played nice the first half of my first strong round tournament, and got +2 in six games playing with young talents: Kramnik, Lautier, Adams, Ivan Sokolov, Ulybin, Akopian, Illescas. However, in the end I lacked concentration, and slipped to -1 after 3 losses. Vladimir Akopian is a person of my age, only one week older than me. He is an example of successful chess career: U-16, U-18, U-20 world champion, and Las Vegas world championship finalist. I also played in the U-20 championship that was held a year before this game. I was on the first place, but then lost to Vladimir. Then I was also defeated by Ulybin, and after that I left the struggle for the first place. And then a year later we met again in Greece in the 14th category tournament. 1.e4 c5 2.¤f3 d6 3.d4. During the youth championship we had 3.?b5+, and I got a good position, but made a mistake in a time trouble. 3...cd 4.¤xd4 ¤f6 5.¤c3 a6 6.?e3 e6. Black chooses the Scheveningen structure. Now White has several aggressive continuations – 7.f3, transposing to the English attack, 7.g4 with subsequent piece sacrifice (7...?5 8.¤f5 g6 9.g5 gf 10.ef etc. ), but in this game I decided to use classic setup with the bishop on ?2. 7.?e2 ?e7 8.f4 ?c7 9.0-0 0-0 10.?h1 ¤c6 11.?e1 ¤xd4 12.?xd4 b5 13.a3 ?b7 14.?g3. Tabia. More than half a thousand games can be found in the database for this position. Here the opponent decided to surprise me with a rare move. 14...¦ad8?! It is a rather unsuccessful deviation from the main variations. In case of 14...¦ac8 15.¦ae1 ?c6 16.?e3 Black equalizes the chances with the help of typical operation: 16...e5! 17.fe ¤h5 18.?h3 de, for example: 19.¤d5 ?xd5 20.?xe5 ?xe5 21.ed ?g5 22.?xh7+ ?xh7 23.¦f5 ?xf5 24.?xf5+ g6 25.?h3 ?d6 26.g4 ¦c2. 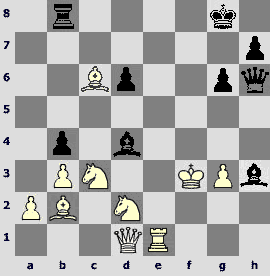 This possibility is mentioned in the monograph of G.Kasparov and A.Nikitin «The Sicilian Scheveningen». 14...?c6 is considered to be strongest here, for example: 15.¦ad1 ?ac8 16.¦fe1 ¦fd8 17.?f3 ¤e8 18.?f2 ¦b8 19.¦d2, a draw (Gallagher-A.Sokolov, Besancon 2003). 15.¦ae1 ?c6 16.?d3 ?b7. With a rook on d8 16...e5?! does not work because of 17.fe ¤h5 18.?f2 de 19.?b6 ?d6 20.?xd8 ?xd8 21.¦d1± (Kosteniuk-Shaposhnikov, St Petersburg 2000). 16...¤h5 could also be followed by 17.?f2. 17.?h3 g6. I was going to answer 17...h6 by 18.¦e3 b4 19.ab (19.¦g3!?) 19...?xb4 20.¤e2 with better play. 17...¤e8 18.¦e3 ?d7 19.e5 g6 20.f5 de 21.?xe5 ?f6 22.?xf6 ¤xf6 23.fg fg 24.?xe6 ?g7 25.?xd7 ¦xd7 26.¦e6 ?b7 27.?g1± (Palac-Hulak, Vinkovci 1995). 18.f5. It is very important to maintain the tension that is hard for Black to get rid of. 18...e5. 18...gf 19.?h6! (19.ef? e5 with an idea of ?h8, ¦g8) 19...e5 20.¦xf5 loses. 19.?e3 ¤h5. 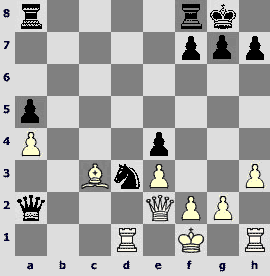 It was a novelty, but it hardly has any value, because White's advantage is doubtless, for example: 19...¤xe4? 20.¤xe4 ?xe4 21.?xe4 ?xe4 22.?h6 ?xc2 23.f6±. An unpleasant answer to 19...¦fe8 is 20.?g5, for example: 20...¤d7 21.fg hg 22.¦xf7 ?xf7 23.?h7+ ?e6 24.?xg6+ ¤f6 25.¦f1. 20.?e2?! It allows exchanging a knight and a dark squared bishop. 20.?h6 20...¦fe8 21.?f3 (21.?e2 ¤f4) 21...?f6 22.¤d5 ?xd5 23.ed± is stronger, as it was in the Wang Pin-J.Shahade, Shanghai 2002. It seems that, having yielded the pawn, Black can sigh with relief: he has two bishops and the control over black squares, where he can fortify his position. Nevertheless, the pawn is the pawn. If we remember the game with Itkis, I attacked there with the same set of pieces on board, but we had equal number of pawns. 22...?g5. Maybe Black had to play more modestly, for example 22...?f6. 23.¦g4 ?e7 (23...?f6 24.¦f1 ?g7) 24.¦f1 ?f6 25.?d3 ?e5. 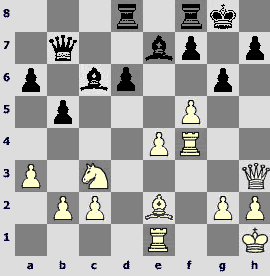 It seems that Black managed to achieve blockading position and impede White's attack. However, as it often happens in my games, at this moment I begin transferring a knight to the main action area. 26.¤e2?! From here the knight can jump to one of three tempting squares – f4, g3 or d4. 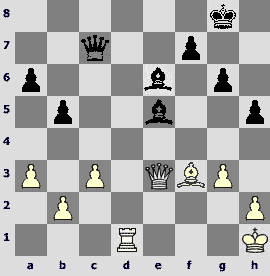 And still one had to play more solidly – 26.¤d1 ?g7 27.¦g3 ?xe4 28.¤f2 ?xd3 29.¤xd3?. 26...?h8. It is a bit coward; one had to capture the b2-pawn: 26...?xb2! 28.e5 de 29.fg fg 30.?xg6 hg 31.¦xg6+ ?g7 32.¦xf8+ ¦xf8 33.¦xc6 ¦f1+ 34.¤g1 ¦xg1+ 35.?xg1 ?c1+ with equality. 27.c3. After the game Akopian showed me how White could win from the very beginning: 27.fg fg 28.¤f4 ?g8 29.¤e6 ?d7 30.¤xf8 ?xg4 31.?xh7+ ?xf8 32.?xg6. 27...?d7 28.¤d4. The knight has occupied a perfect position in the centre. It is hard for Black to get rid of the tension on the f-file, and he is still a pawn down. 28...¦de8 29.¦gf4 d5?! This move only allows the d3-bishop joining the attack, while hopes to pin the f5-pawn do not come true. Black had to play more solidly – 29...?g7, although after 30.?b1 and the bishop transfer to ?2 White gets a great advantage. 31.¤e6!? 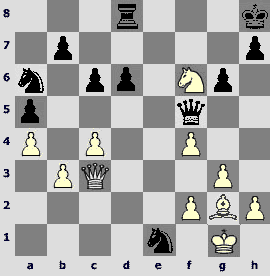 White also had other, more accurate way to the victory: 31.?h6 (with a threat of 32.fg!) 31...?g7 32.?h4 g5 33.?xg5 f6 34.?h4. 31...¦xe6! 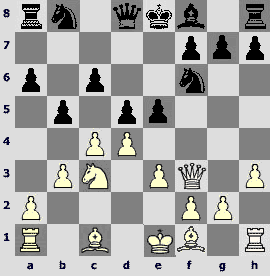 It is the only move that allows Black to continue resistance. 31...fe? 32.fg or 31...?xe6 32.fe ?g7 33.ef ¦e6 34.¦h4 h5 35.?xg6 was losing. 32.fe ?xe6 33.?e3. 33.?f3 was simpler. 33...?g7 34.?e4 ?d6 35.¦4f2 ¦d8 36.¦e1 ?g8 37.?f3 h5 38.¦ff1 ?c7 39.¦d1 ¦xd1 40.¦xd1. White took some pressure off the position by trading rooks. 40...?e5 41.g3! 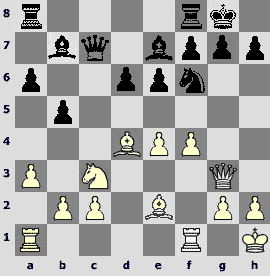 White's pawns have to be placed on dark squares to restrict the e5-bishop. In case of 41.h3?! ?b3 great problems with converting the material advantage could arise. 41...?g7 (41...h4 42.?g5! hg 43.¦d8+ ?g7 44.?h4) 42.¦e1 ?f6 43.?e4 ?c5 44.?g2 a5 45.¦d1 ?c4 46.¦d2 ?e6 47.¦d1 ?c4. The move repetition is just a simple trick that underlines strength of White's position. 48.¦d7 b4. 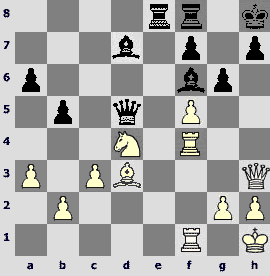 48...?c8 49.¦d6 with subsequent ?f4 ended the f6-bishop era. 49.ab ab 50.cb ?c8. 50...?xb4? 51.?e2 ?a4 (51...?b5 52.¦xf7+!!) 52.¦d4!. It is simple but beautiful. 51.¦d2 ?b5 52.¦c2 ?a6 53.?e2 ?xe2 54.¦xe2 h4 55.g4 ?d6 56.g5 h3+ 57.?f3. Black resigned. 1) If one decides to apply a novelty in a well known position, then it has to be well analyzed and thought-out, because deviating usually means trouble. It happened so in this game, after 14...¦ad8 White got a long-lasting initiative. 2) 20...¤f4 is a typical tool, a pawn sacrifice for controlling dark squares. The e7-bishop goes to f6, and its influence sharply increases. 3) In situations when the play is very sharp, the most concrete approach is required. If one plays according to general considerations (26...?h8), one has a chance not to save the game. One has to calculate the most principled variations till the end, because sometimes the course of the game makes one choose more sharp continuations. In contemporary chess the classic "trainer-pupil" scheme is almost absent; it remained maybe for the very young chess players. Instead the cooperation of strong chess players, so-called seconding, and sometimes sparring partnership became widespread. 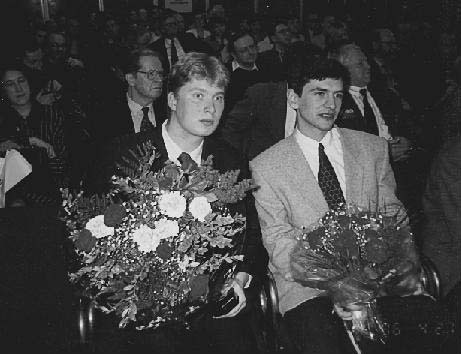 My debut as a second took its place in the autumn of 1992, when Alexei Shirov invited me to help him during the Tilburg tournament. At some moment friendly relationships developed into a fruitful cooperation. We worked on chess together and were sparring partners. In those cases when I seconded him during tournaments, Alexei was generous and my work was well paid. If we digress a little and talk about seconding, the main function of a helper from my point of view is psychological support. A high class grandmaster plays what he knows; it is hard to learn something new during the tournament with the second's help. Of course, occasional tip might be useful, but the most important thing that the helper should be able to do is to create necessary atmosphere, help the player to recover after a difficult game, support him. When I worked with Shirov, there was no such informatization and computerization of chess. Yes, I shared Chebanenko's ideas with him, we discussed Lanka's schemes, invented something ourselves, but generally speaking there was no intensive opening preparation. However, while working with me, Shirov almost avoided defeats in high-level games. Of course, he had achieved that thanks to his talent first of all. Our fruitful cooperation lasted till 1996. Although we did not meet very often (I continued my career nevertheless), I joined him for the main tournaments. Running ahead, I will say that I acted as second again in 2002; Ruslan Ponomariov invited me to help him during the Linares tournament. The situation was somehow like the aforementioned one, although the initial stimulus was not friendship, but Ruslan's sponsors' proposal to participate in the training session at their expense. In Linares Ruslan took the second place, and it was one of the best achievements in his career but for the victory in the world championship of course. I would not say that I helped Ruslan greatly with his openings. The second just has to be a good psychologist; I mean not a professional one but a person that produces kind and positive emotions. For me the wife has always been the prefect second. So, in Dortmund-2003 the majority of players had strong grandmasters as helpers. 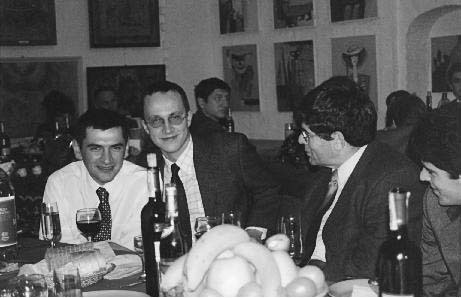 For example, Rustem Dautov helped Anand, Arshak Petrosian seconded Leko, and I came with Margarita and won the tournament. This proves the fact that psychological factor is on the most important for chess players. Coming back to the 1990s that were wild in all respects, I should mention that, despite becoming a chess helper on my own will, I still preserved my sporting ambitions in full measure. But ambitions themselves are not enough. Unfortunately, I could not state sporting task for myself more clearly. I rather followed general considerations. I supposed that going with Shirov to Linares or Tilburg would be useful for me anyway, because I would have a chance to work with a great player. I really found out a lot of interesting new things, but this work did not increase my practical strength. I earned enough, but while you do not have family, money is not of great significance. Anyway, I do not regret this work. In the spring of 1993 before graduating from the university I faced the question where to live and what to do. The decision came from overseas all of a sudden, but I will tell about it a bit later. I got to my first New York Open with many adventures. During the check-in I was the only one in the group consisting of former Soviet Union chess players who was not allowed to board the plane. It turned out that only Moldavians had to get transit Irish visa (in those times planes from Moscow to America flew via Shannon). I had to wriggle out of it, and after 24 hours of struggles with Aeroflot and Irish embassy I managed to board the plane and come to the tournament several hours before the start. I played in America for the first time. I felt as if I arrived to the other planet. People are the same, houses are made of stone, cars have wheels, but I still cannot get accustomed to American life rhythm. Maxim Dlugy was the junior world champion, and then he became a businessman and succeeded in his new field. Then we made friends with him, and for some time I even worked in the Moscow representative office of his company, and this game was the starting point of our acquaintance. 1.d4 d5 2.c4 c6 3.¤c3 ¤f6 4.e3 a6. The Chebanenko variation of the Slav defense. Its pure form arises in case of 4.¤f3 instead of 4.?3. Black has rich possibilities here: the ?6-pawn restricts the ?3-knight; the play with b7-b5 becomes possible either immediately or after the exchange on ?4. This obviously prophylactic and waiting move makes White chose one of nine possible moves and plans. Chebanenko had decent original answers to them all. By the way, no refutation of it is found so far. I do not know any other variation suggested by a non-professional chess player that would have remained not refuted that long. 5.¤f3 b5 6.b3. This continuation still occurs in tournament practice. 6...?g4. 6...?f5 7.?d3 e6 8.?xf5 ef 9.0-0 ?d6 10.?d3 g6 11.a4 dc 12.bc b4 13.¤e2 ¤bd7 14.?b2 0-0 15.¦fd1 ?e7› (Kasimdzhanov-Sakaev, Bundesliga 2003). 7.h3. 7.?e2 is considered more popular nowadays. 7...?xf3 8.?xf3. Nowadays White usually connects 7.h3 with the pawn capture, for example: 8.gf ¤bd7 9.f4 e6 10.c5 ¤e4 11.¤xe4 de 12.?g2 f5 13.f3 ef 14.?xf3 ¦c8 15.?e2 with White's advantage (Vallejo-I.Sokolov, Selfoss 2003). 8...e5!? This variation was worked out by Vyacheslav Andreevich about 30 years ago. And of course it was unexpected for Dlugy. Possibly, the more precise version is the preliminary exchange on c4 by 8...bc. 9.de ?b4 10.?d2 ?xc3. In case of 10...¤e4 11.¤xe4 de 12.?d1 ?xd2+ 13.?xd2 ?xd2+ 14.?xd2 ?e7 15.?c3 White's chances are still better. 13.?g4!? c5 14.?xg7 ¦f8 15.¦d1 ?b6 16.?d2 c3 17.?c1 c2 18.¦d3 c4 (Hillarp Persson-Ibragimov, Scelleftea 1999). 13...?b6 14.a3 a5. The bishop leaves an important diagonal. 15.cd cd (15...ab 16.?xe4 ¦xa3 17.¦b1) 16.?d2! (16.?c4 ?c6; 16.?d6 ?b2 17.¦d1 ?c3 18.?e2 ¤d7 19.¦xd5 ?c4 20.¦d3 ¦c8 Poluljahov-Moskalenko, Rostov 1993) 16...?b2. 16...¤xd2?! 17.?xd5 ¤xf1 18.?xa8 0-0 (18...¤xe3 19.fe ?xe3+ 20.?f1 ?d3+ 21.?f2 ?d4+ 22.?g3 ?xe5+ with a draw) 19.?e4 ¤d2! 20.?c2 ¤b3 21.¦b1 a4 22.0-0 ¤a6 23.?c4 ¤ac5 24.¦fd1›. 17.¦d1 ¤c6 18.a4?! White wants to strengthen the bishop on b5, but it was far more important to finish the development right away: 18.?d3 ¤xe5 19.?e2 0-0 20.0-0 ?xa3 21.?xe4 de 22.?b5! and ¦a1=. 18...0-0 19.?d3 ¤xe5 20.?e2 ?a2 21.?xe4 (21.0-0 ¤xd2 22.¦xd2 ?xa4µ) 21...de 22.?c3?! (22.0-0 ?xa4µ or 22...¦fd8µ) 22...¤d3+ 23.?f1. White is again without a chance to castle in a difficult position. 23.¦xd3 ?xe2+ 24.?xe2 ed+ 25.?xd3 ¦fb8µ is better. 23...?xa4 24.¦a1 ?c4 25.?d4 a4 26.?g1 f5 27.?h2 ?c7+ 28.g3 ¦fc8 29.¦a3 ?c2 30.¦a2 ?xe2 31.¦xe2 a3 32.g4 fg 33.hg ¤c1. It was more simple to play 33...¦c1 34.¦xc1 ¤xc1 35.¦c2 ¤b3 36.?e5 a2 37.¦c7 g6! (or 37...a1? 38.¦xg7 ?h8 39.¦e7 ?xe5 40.¦xe5 ¤d2°) 38.¦g7 ?f8 39.¦xh7 a1? 40.?xa1 ¦xa1 41.?g3 g5! 34.¦ee1 ¤b3 35.¦e2 ¦c1 36.¦xc1 ¤xc1 37.¦c2 ¤b3 38.?e5 ¦a7? By 38...a2 one could go on to the variation analyzed in the annotation to the 33rd Black's move. 39.¦a2 ¤c1 40.¦a1 ¤d3 41.?d4 ¦a4 42.¦a2! ?f7 43.?g3 g6 44.¦c2 ?e6 45.¦c7 a2 46.?a1 ?d5 47.¦xh7 ¤c5 48.?f4 ¤b3 49.¦h1 ¤xa1 50.¦xa1 ¦a6 51.g5 ¦a4 52.¦d1+ ?e6 53.¦a1. 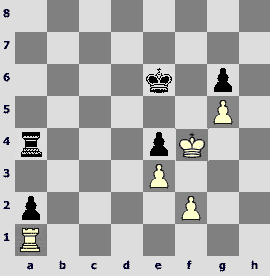 The triangulation provides Black with the victory. 53...?d6! 54.¦d1+ ?e7! 55.¦a1 ?e6 56.?g4 ?e5 57.f4+ ef+ 58.?xf3 ?f5 59.?e2 ?xg5 60.?d3 ?f5. White resigned. 1) Sometimes non-standard solutions in the opening allow imposing a non-typical play on the opponent, the initiative playing an important role in it. With White having an advantage of two bishops, Black has taken higher obligations and had to develop the opening initiative quickly. 2) Non-castled king always increases the degree of risk, especially when opponent's pieces are dangerously close to it. 3) During the realization of the advantage one has to preserve concentration of attention and calculate the concrete variations accurately. If one continues to play guided by general considerations, the advantage can be vanished. During the tournament my friend Dina Tulman advised me to become a student of Mark Izrailevich Dvoretsky for a start. I do not know whether her recommendation turned out to be so good or Dvoretsky decided that something would come out of me, but he became my teacher. My results improved. I gained 100 rating points in a year. At the same time my tactical vision sharpened. To prove it I will cite an episode of my first tournament in Biel. White captured the f6-pawn with the last move, threatening a classic discovered check. 28...¤d3! Black has an extra pawn, and he is ready to sacrifice the knight on e5 to block the dangerous diagonal. 28...?g7 29.¤g4+! (29.¤h5+? ?f7 30.?g7+ ?e6°) 29...?f8 30.¤h6! ?e6 31.?h8+ ?e7 32.?g7+ ?e8 33.?h3! ?e7 34.?g8+ ?f8 35.?e6+ ?e7= is weaker. 29.?e4 (29.¤g4+ ¤e5 30.fe ?xg4 31.ed+ ?g8 32.?f6 ¦d7°) 29...¤xf4! Black uses tactic motif again: the fork on e2 threatens. The struggle for the key square e5 goes on. 29...?e6 30.?xd3 ?e7 31.g4 with an idea of g5 is weaker. 30.¤g4+ (30.?xf5 ¤e2+; 30.gf ?xf4 31.¤g4+ ?g8) 30...?e5. 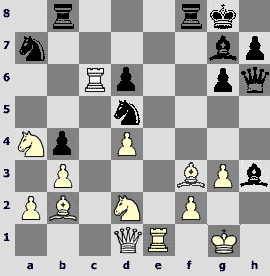 Here the combination ends, and White has to proceed to the endgame without a figure. 31.¤xe5 ¤e2+ 32.?g2 ¤xc3 33.¤f7+ ?g7 34.¤xd8 ¤xe4 35.¤xb7 ?f6 36.¤xa5 c5, and gradually I managed to convert an extra piece. Dvoretsky, who is gifted by the nature not only with chess talent but also with remarkable capacity for work, managed to create his own system of working under specified chess skills. Using to his method, one can improve skills in any component of chess mastery: positional play, tactical vision, prophylaxis, calculation. In comparison with Chebanenko and Lanka, his lessons were absolutely different. Mainly I solved problems: you learn the theory and start training in solving problems, playing certain positions. So, by becoming Dvoretsky's student, I followed Chebanenko's instructions four years late. The lessons with Dvoretsky influenced my decision to stay in Moscow. And as I almost had not studied for two last years at the university, and I always had a constant thirst for knowledge, I decided to bridge the gap, and entered a post-graduate study. During the first year I visited a majority of lectures, although I took active part in the competitions. We had an excellent philosophy course. Every post-graduate student had to prepare the report on a topic interesting to him, and then the discussion followed. There were reports on Christianity (my topic), Buddhism, ancient philosophers, existentialism etc. We also had lections on esoterics. Now nobody is amazed by astral or Buddhism, and in those times it was something new. Having become a post-graduate, I decided to come back to the dormitory, where I had a separate room that I had got for the previous public work as a head of the students social services committee. First of all I had to exterminate cockroaches that in the time of previous owners used to run behind the wall paper and to rustle so loudly that it was impossible to sleep. There were tons of garbage there! After my clean-up, the metamorphosis misled students when they visited me. They thought they just opened a wrong door. In the autumn of 1993 before the tournaments in Ostrava and Gran Canaria, Dvoretsky told me not to get into time trouble. During the game I had an anti-Zeitnot time record, the point of which was not only to fix the time spent on every move, but also to spend not more than 50 minutes on first 20 moves, to leave at least 3 minutes for every move, and to follow this schedule even if it damages the quality of games. I fulfilled it as an obedient pupil, and you know it helped! I won both tournaments, and at Canaries I began with 8 out of 8 and made a quick draw only in the last game. Ostrava was almost the first tournament where our cooperation with Dvoretsky really started to pay off. Sarhan Guliev is an interesting and original grandmaster who was a leader of the Azerbaijan team at first at the USSR Spartakiads and then at the Chess Olympiad. The last White's was capturing the c6-pawn with the rook, and now the knight on d5 hangs. And here the «carrousel» begins. 23...¤c3! 24.¤xc3. After 24.¦xc3 bc 25.?xc3 (25.¤xc3 ?xd4 26.¤de4 ?g7!) 25...¤b5 26.¤e4 Black gets an advantage. 24...¤xc6 25.?xc6 ¦xf2!! A sudden although a rather typical blow; by the way, it is an intermediate move also. Now the d2-knight hangs, and there is an eventual threat of ?g4, so White has to take the rook away and go to the center with his king. 26.?xf2. Or 26.¤ce4 ¦g2+ 27.?h1 ¦xg3 28.¤xg3 ?g4+ 29.?g1 ?xd1 30.¦xd1 ?e3+ 31.?g2 ?xd4 32.?xd4 ?xd4; 26.¦e2 bc 27.¦xf2 cb. 27...?g4+! 28.?e4. One could get mated in the centre of the board: 28.?xg4 ?h5+ 29.?f4 ?f5#. 28...?xd1 29.¤xd1 ?xb2 30.¤c4 ?g5 31.¤de3 ?xg3 32.¦f1 ¦f8 33.?d5+ ?g7. White resigned. In the second year of post-graduate studies in the autumn of 1994 I finally moved to a flat in Strogino. This district is situated in the northwestern Moscow, opposite to the famous Serebryany Bor; the district is surrounded by parks. It is one of a few places in Moscow where you are allowed to swim in the Moscow River. Shortly speaking, it is a resort in a megapolis. But the main motive was becoming Dvoretsky's neighbor. I rented the flat from his acquaintances. One can swim in summer, jog in autumn and in spring, and go skiing in winter, «Sheremetyevo-2» international airport is in 20 minutes ride. What else is necessary for a chess player? I lacked this elementary requirement of any chess professional for a long time. I dove in a sharp pique that autumn, and entered yet another chess recession. It all began when I went to play in the Romanian League with severe cold. It was extremely "professional"! The loss of 40 rating points turned out to be rather painful, and it took me two long years to come back to the 2600 level.